The Meeting Creek railway station was built by the Canadian Northern Railway in 1913 to its standard third-class station plan. Today it represents one of the few remaining examples of this design, and is unique in Alberta, being preserved on its original site with both a portion of the original railway together with a classic prairie grain elevator. The station has been wonderfully preserved and houses photographs and artifacts pertaining to life in the prairie railway depot. This depot served as a railway office, passenger and freight depot, and provided living quarters for the station agent. The main entrance to the station is known as the waiting room. This was the area in which patrons could wait for scheduled passenger trains, or conduct business with the railway agent at the counter. Next to the waiting room is the agent office or ticket office. It was in this office that the agent conducted railway business, which included ticket sales, sending telegrams by Morse code on the company telegraph, and settling express freight accounts. In addition, the agent also doubled as a train order operator, preparing written instructions received from a train dispatcher that were necessary for the safe movement of trains, and ensuring safe meeting points for opposing trains. The freight shed of the railway station depicts the types of express formerly moved almost entirely by the railways until the late 1960s. With the abandonment of the railway serving Meeting Creek in 1997, Central Western Railway donated a portion of the original main line and elevator track to the Canadian Northern Society. 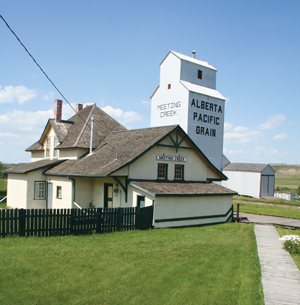 The Alberta Pacific Grain elevator at Meeting Creek, built in 1917, is a classic example of a wood-cribbed prairie grain elevator. Perhaps more than any other building, these distinctive structures have come to represent western Canada to the world. Despite the link with our history, the number of grain elevators has been drastically reduced across the prairies over the last decades as a result of rationalization and a move to modern high-throughput facilities. The Meeting Creek elevator had a capacity for approximately 40,000 bushels of cereal grain. The office attached by a walkway to the main driveway served as a location for the elevator agent to conduct company business and settle payments to farmers for their deliveries of grain. A hydraulic engine is located in the back portion of the office that drove the main conveyor (or “leg”) of the elevator. Grain delivered to the driveway was weighed, graded, and dumped into a pit. It was then elevated by a vertical conveyor (a “leg”), which consisted of a series of cups on a belt, to the top of the elevator (the cupola). Using a “Gerber wheel” the agent could select bins in which to store the grain. Eventually, grain would be emptied from the bins, re-elevated, and loaded into rail cars for movement to market. The Meeting Creek elevator served the farming community in this area until 1984 when it closed. It was donated to the Canadian Northern Society for preservation in 1990. The station grounds and right-of-way now form the basis for a local park–picnic tables and washroom facilities are available. 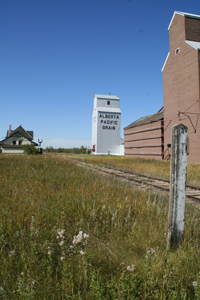 The station together with the Alberta Pacific Grain elevator is a Designated Provincial Historic Resource. Both sites are maintained by dedicated volunteers from the Canadian Northern Society and are open to the public during special community events and by appointment through the Camrose Heritage Railway Station office at 780 672 3099 or see the station entrance for access information. Guided tours of the station and elevator are also available. The East Central Alberta Heritage Society has since 1998 worked to preserve the old Canadian Northern Railway Battle River Subdivision (ex CN and Central Western Railway Stettler Subdivision) as a heritage railway (Stettler to Big Valley) and as a Linear park from Edberg to Stettler via Meeting Creek and from Big Valley south to Morrin. 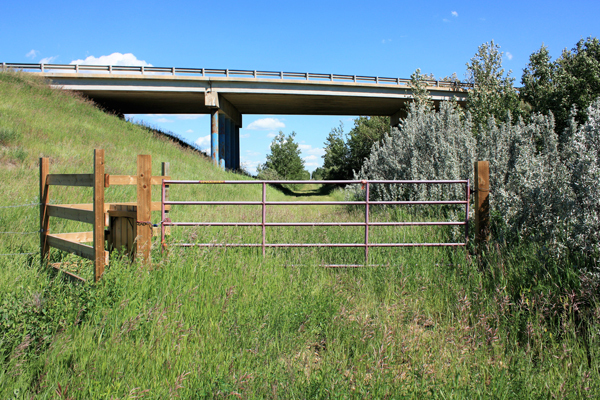 At Meeting Creek our Society is the owner and steward of the station grounds and over one mile of right of way where we have preserved a section of the original 60 pound steel railway and now are preserving prairie grasslands on the station grounds. Together with the East Central Alberta Heritage Society we have preserved an important piece of Canadian Northern history as well as an environment for plants birds and wildlife that is second to none on the prairies. All trails are open year round to the public under the posted guidelines for use and following trail ethics. For Discovery Kits, trail tours or access to the gate code for horseback riding the southwest trail call 780-672-3099 or email canadiannorthern@telus.net. Motorized vehicles are not permitted on the trails. For outdoor recreation use for hiking, horseback riding, cycling, wagon treks, picnics, skiing and snowshoeing. The flora and fauna change with the seasons: come often and enjoy! We encourage visitors to enjoy related attractions that central Alberta has to offer—visit Tourism Camrose for more information. 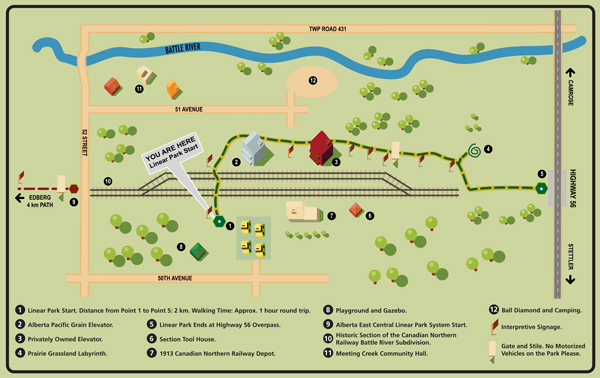 TRAIL LOCATIONS: Visit the map interpretative sign near the elevator for directions to the trails. The trailhead developed by the Alberta East Central Natural Linear Park Society northwest of the station is located across the paved road leading into Meeting Creek. Stop and read the signs before you enter the stile. An outhouse and picnic tables are located 2 km down the 4 km trail (one way). The southeast Grassland Trail developed by the Canadian Northern Society begins at the map sign near the restored elevator. This 2 km (one way) trail has interpretive signage throughout the park site and along the trail to highway 56. Please download the Meeting Creek Natural Linear Park Trail brochure and bring it along with you for your walk of the area. Please ensure that you carry any garbage out with you. New interpretive signs have been erected along the trail beginning at the historic Canadian Northern Railway Station and Elevator and strategically along the trail. For more information on the East Central Natural Linear Park visit the Linear Park Information Brochure online at the East Central Alberta Heritage Society. The above trail map is available for download.